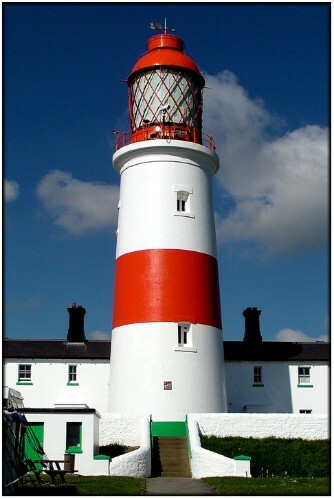 Although inactive since 1989, Souter is still a very impressive example of lighthouse design and engineering - the work of James Douglass, possibly the most famous British lighthouse engineer after the various members of the Stevenson family. It is in the care of the National Trust and is beautifully maintained and open to the public from 12 March to 30 October (except Fridays). When built, it was one of the most technologically advanced lighthouses in the world and was the first to be powered by alternating current electricity. Its name is interesting as it is located on a headland known as Lizard Point near the village of Marsden. 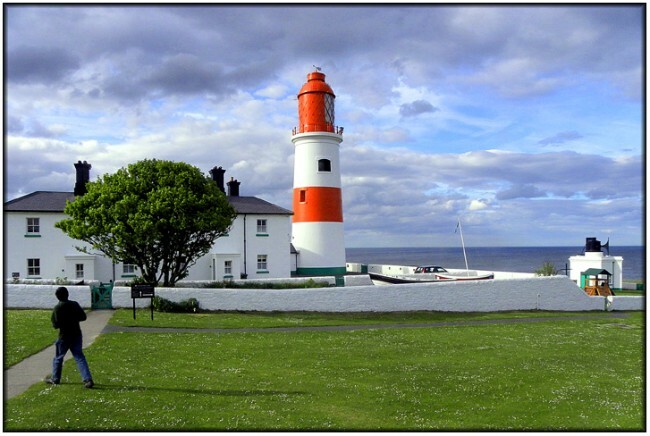 However, the original site selected for the lighthouse was at Souter Point, about one mile north of its present location. Before construction commenced it was decided that Lizard Point would be a better location as the cliffs there are higher and the lighthouse would be visible from a greater distance. Of course, there was a very important lighthouse in Cornwall (that will appear on this site later) that was already called Lizard Point so, to avoid confusion, the original name of Souter Point was retained. This may avoid confusion for seafarers but it certainly adds to the chaos for visitors unless you know the original story. Obviously access is no problem at all subject to paying the required National Trust entrance fees and there is a public car park close to the site. However, the best photos of the lighthouse can probably be obtained from outside the site itself. The site is surrounded by a low stone wall but that presents no obstacle at all in photographic terms. The light should be ok from around mid morning through to the late evening in summer. The image below gives a better overview of the whole station and also shows, in the right of shot, the foghorn building. Also in shot is my friend and fellow pharologist, Greg Fitzgerald, from New York who, as closing time was fast approaching, was dashing around frantically trying to get the "best angle" before we were ejected from the car park!